Depression has a way of convincing you that you don’t matter, that you are unimportant, that nobody in your life really understands or cares for you. When I think of depression, sadness isn’t even a word that flashes by in a list of related feelings. When I think of depression, emptiness and worthlessness are the words screaming in my mind. I’ve been haunted by the specter of depression for the majority of my life. It’s followed me through self-injury as a child, dreams of no longer existing starting in high school, and periods of being so paralyzed that even opening my eyes became a battle. Not being able to name the beast that shadows you gives it that much more power, so being diagnosed with major depressive disorder (among other things) halfway through 2013 gave me a slight reprieve. The end of 2013 was, in a way, the beginning of becoming a new person. Anyone who has been in the unusual position of rejoicing during a divorce may be able to relate, but the end of my marriage was the best thing that could have ever happened to me. I had given up so much of what I loved in order to try and conform to the person I believed my husband wanted me to be. He teased me for reading, so I scaled back the amount of books I read. He was far more interested in action and sport movies, so I no longer watched the kinds of movies that made me use my brain. My music taste and food choices even changed. I was no longer a person I recognized, but I slowly began to gain it all back after I took back my life. Some might say that leaving the city I shared with the man who had begun to haunt my dreams and moving to an entire new country was a drastic escape attempt. I first tried moving a state away, but the dreams and the emotions followed me. Relocating halfway across the world was running away from my problems, but I was aware it wasn’t going to be a permanent fix. It was a way to catch my breath, gather my thoughts, and begin to heal without the attachments of home. There was never a moment when I sat back and decided that I was ready to reenter the dating world. In fact, I was the complete opposite. My depression still ate away at my confidence and ability to experience joy, so I put on the “tortured soul” persona and wore it like a second skin. I began to believe that my depression, my PTSD, my divorce, and even my miscarriage during the second year of my marriage were somehow all things that made me too broken and weighted down with too much baggage for anyone to want to deal with. During this period, writing began to be a more constant presence in my life, and I started to write myself into short character descriptions as practice for a larger project. I didn’t realize at the time that completely shutting off the sensitive part of me - the part that cared about the consequences of my actions - was so opposite of my personality that it was impossible for it to last too long. And when that uncaring persona faded away again, the regret and shame that swept over me when I thought about the hurt I possibly had caused others almost overwhelmed me. This added an entirely new layer to the belief that I was too troubled for anyone to truly care. This time around, I wanted to do things differently. I wanted to be able to be open and honest about my past without allowing it to dictate my future, as cliché as that may sound. I had a small sliver of a belief that there were people out there who could still love and care about me even though I now viewed myself as such a fractured person. I didn’t want to push away possible friendships just because I didn’t trust that the other person could see past my flaws. This period of learning and transforming took place throughout most of 2015. It was a painful year full of setbacks and embarrassing tears held in the arms of friends. It was mostly a year learning to be vulnerable and accepting that my mental health will probably always define a part of who I am, but not allowing it to dictate every part of my life. It was a hard year, and toward the end of it, I decided relocating back to where my depression first really took a hold on my life was necessary. It was a way to prove to myself that I had made progress and that my ghosts weren’t going to control the direction of my life any longer. So I returned to the place I had first lost all mental stability with the hope that I would come out on the other side an even stronger person. With this move, I carried the intention of finally learning to love myself. I had accepted that my mental health issues were permanently part of who I was, but I had yet to believe that every single part of me was worth loving, especially the ugly parts. I began a self-led meditation that focused on living a healthy, purposeful life and started noticing characteristics and qualities that I could be proud of. That breakthrough was one of the most exciting moments in recent memory, and I think it’s the only thing that has led me to where I am in life now. In mid-December, I found myself on my apartment balcony sharing my life story. The conversation lasted from a little after midnight until several hours after sunrise, and there wasn’t a single minute when I was worried or scared of being judged or viewed as too broken. Typically, I carry my filter far beyond getting to know somebody and all the way to friends who have known me for years because I’m always concerned that my problems will make me seem like a burden or too much trouble. This time, however, the filter was completely stripped away. I allowed this person to see every single dark part of my past and my present, and I didn’t experience any shame. 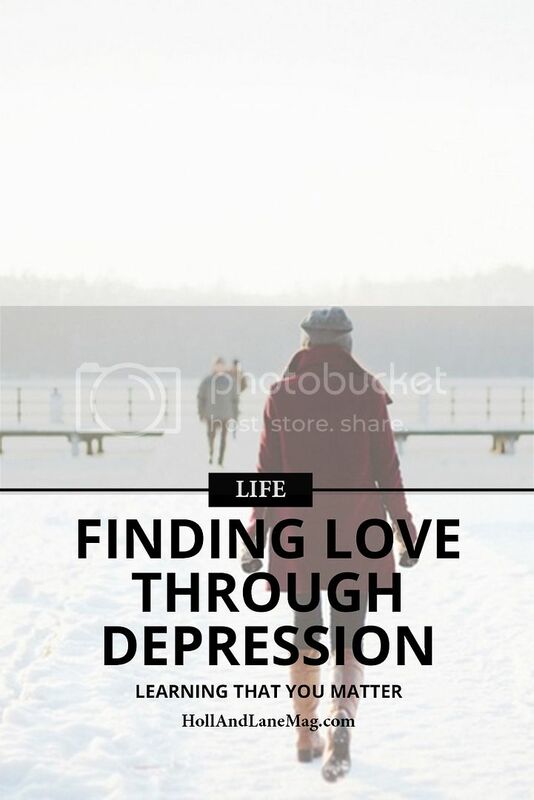 So perhaps it’s a little twisted to claim that I found love through my depression, but my depression is the only thing that led me on a journey of escape, of recovery, and of learning to be content with blending the bad parts of me with the good. If love is total acceptance, then I’ve finally found it.